only the results of response spectrum analysis (RSA). good practices for properly detailing the reinforcement. 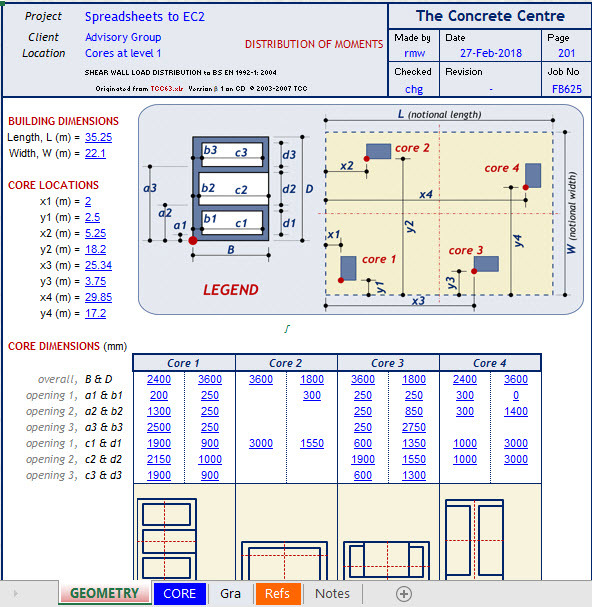 In this spreadsheet , the principles of Eurocode 2, part 1-1 are applied to the design of core wall. when subjected to patch load was studied here. performance in terms of ductility and splitting failure. In flat-plate floors, slab-column connections are subjected to high shear stresses produced by the transfer of the internal forces between the columns and the slabs (ACI-421.1R-08, 2008; ACI-421.1-99, 1999). Normally it is desired to increase the slab thickness or using drop panels or column capitals of exceptionally high strength for shear in reinforced concrete slab around the supporting column. Occasionally, methods to increase punching shear resistance without modifying the slab thickness are often preferred (Cheng and Montesinos, 2010). The ways to transfer the force from column to the slab need to be studied to increase the shear resistance. Several reinforcement alternatives for increasing punching shear resistance of slab-column connections, including bent-up bars (Hawkins et al., 1974; Islam and Park, 1976), closed stirrups (Islam and Park, 1976), shearheads (Corley and Hawkins, 1968), and shear studs (Dilger and Ghali, 1981), have been evaluated in the past five decades. 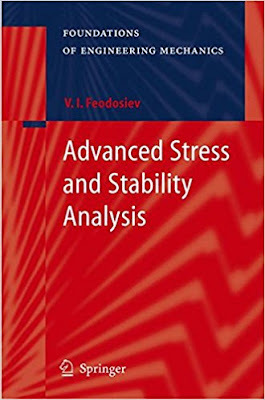 But there is a little experimental and theoretical information about the influence of patch area or cross section area shape for supporting column in the reinforced concrete shear resistance. or emerging tasks at all phases of system development. funding for sustained preservation and renewal of these systems. system longevity, reduced exposure to torts, optimal use of the taxpayers’ dollar, and other benefits. 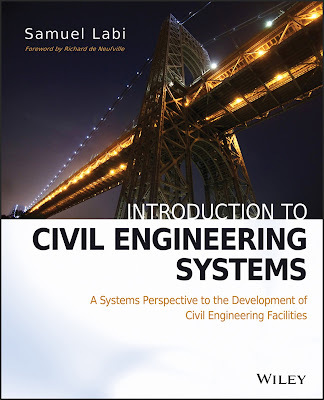 concepts of sytems engineering. This text addresses these issues. bang is now sought for every dollar spent on these systems. 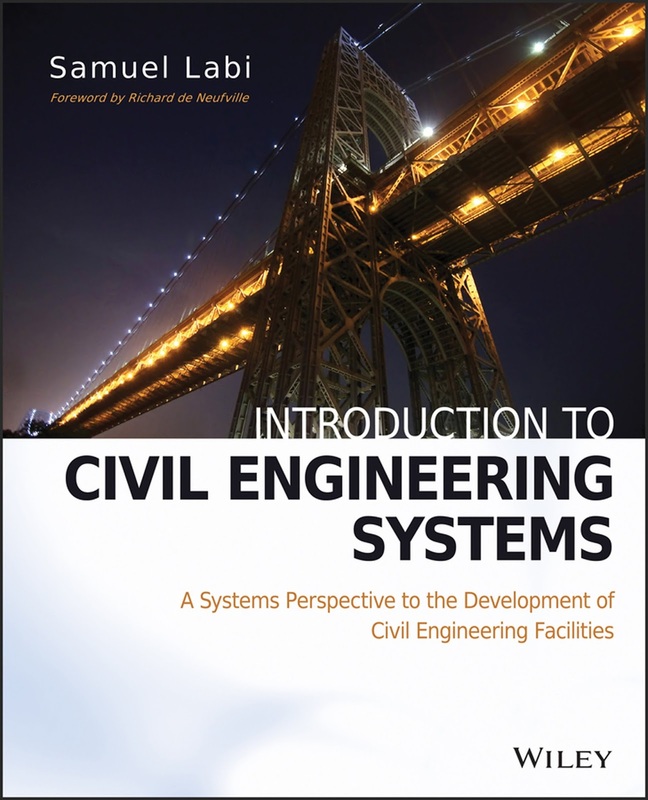 As such, civil system engineers are increasingly being called upon to render account of their fiduciary stewardship of the public infrastructure and assets. 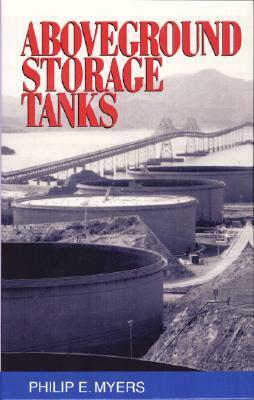 This is best done when the development of such systems is viewed within a phasal framework, when civil engineering system managers acquire the requisite tools needed to address the tasks at each phase, and when these managers provide evidence of organized planning for long-term life-cycle development of their systems. 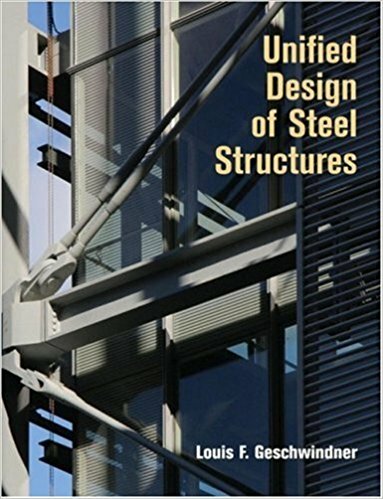 Design of Steel Structures of the Canadian Standards Association (CSA) governs the design of the majority of steel structures in Canada. Clause 27 of the standard includes the earthquake design provisions for seismic force resisting systems for which ductile seismic response is expected. Technical changes and new requirements have been incorporated in the 2009 edition of CSA S16, including modifications of the expected material properties for HSS members, consideration of protected zones, definitions of brace probable compressive and tensile resistances for capacity design and special requirements for braces intersecting columns between floors for concentrically braced steel frames, new seismic provisions for buckling restrained braced steel frames, design and detailing requirements for built-up tubular ductile links in eccentrically braced steel frames, changes to the requirements for ductile steel plate walls and for plate walls with limited ductility, including allowances for perforations and corner cut-outs in infill plates, and special provisions for steel frames of the Conventional Construction category above 15 m in height. These modifications were developed in parallel with the 2010 National Building Code of Canada (NBCC). The paper summarizes the new CSA S16-09 seismic design requirements with reference to NBCC 2010. 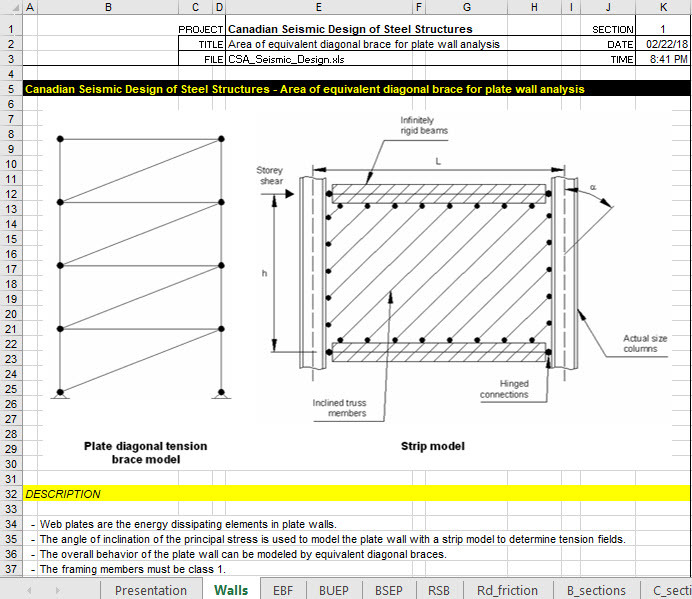 Basic capacity design provisions are given in CSA S16 to ascertain that minimum strength hierarchy exists along the lateral load path such that the intended ductile energy dissipation mechanism is mobilized and the integrity of the structure is maintained under strong ground shaking. In the design process, the yielding components of the SFRS may be oversized compared to the specified design seismic forces, as would be the case when drift limits, minimum member sizes or non-seismic load combinations govern the design. In this case, it is specified both in NBCC 2010 and CSA S16 that the design forces in capacity-protected elements need not exceed those induced by a storey shear determined with RoRd = 1.3. This upper bound essentially corresponds to the elastic seismic force demand reduced by 1.3, recognizing that nonyielding components will likely possess minimum overstrength. This 1.3 reduction factor only applies if the governing failure mode is ductile, and RoRd = 1.0 must be used otherwise. - Section 1: Area of equivalent diagonal brace for plate wall analysis (Walls). - Section 2: Design of link in eccentrically braced frames (EBF). - Section 3: Design of Bolted Unstiffened End Plate Connection (BUEP). - Section 4: Design of Bolted Stiffened End Plate Connection (BSEP). 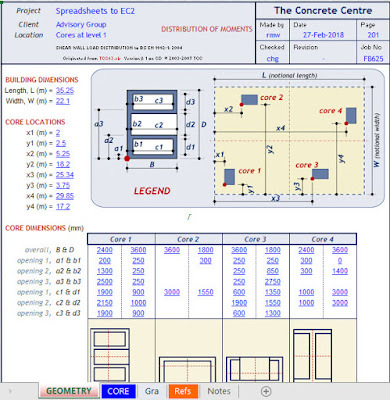 - Section 5: Design of Reduced Beam Section Connection (RBS). - Section 6: Force reduction factor for friction-damped systems (Rd_friction). - Valid beam sections for moment-resisting connections (B_sections). - Valid column sections for moment-resisting connections (C_sections). - Valid bolt types for moment-resisting connections (Bolts). - Database of properties of all sections (Sections Table). diminishing of experimental methods and experimental stress analysis (ESA) in particular. the solutions required are not amenable to simple or discrete answers. and these were the models. In some cases, a scaled physical construction was the model. are computed on the fly for different loads; it is not just a database of numbers or graphs. 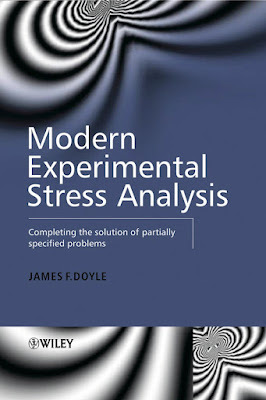 that traditional experimental stress analysis is incapable of giving. it is uncertain as to how the strains are to be obtained. training but also in their further engineering activity. results in case the readers intend to solve the problems in their own manner. are required. The book is aimed at the demands of those students, most of all. specialists and extremely thanks his lucky stars and friends for that. 20th century – a race into space. on analysis of some advanced engineering problems. was head of the Space Missile Engineering Department. quite early. Feodosiev’s …nal student project was quali…ed as a PhD thesis. in machines when he was 27 years old. to identify improved designs with respect to performance and cost. in the design of complex or large systems. degree on the algorithms available for the solution of the resulting equations. 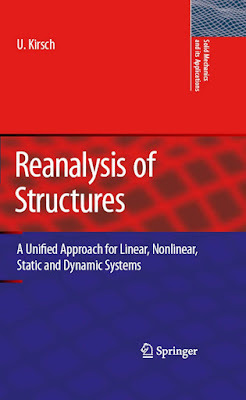 or in dynamic analysis, when the solution must be repeated many times. An analysis may not be possible if the solution procedures are too costly. has been invested in equation solution algorithms. The material of the structure is elastic and obeys Hooke's law. small and can be neglected. 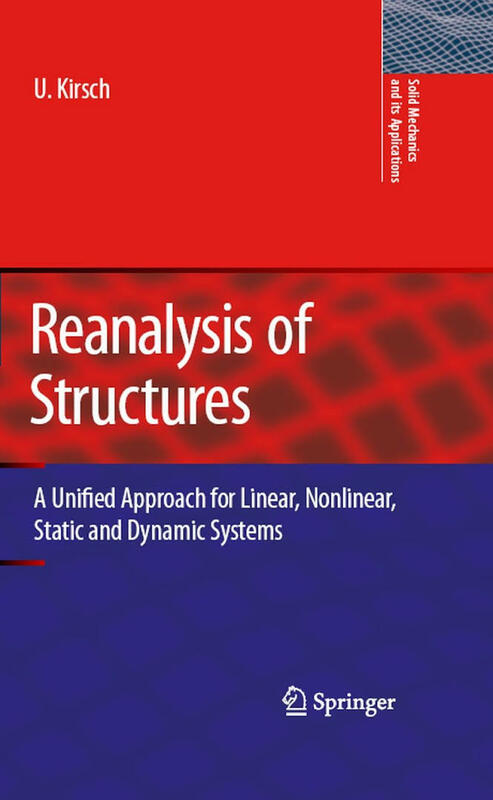 structural analysis involves solution of a set of simultaneous equations. changes without solving the complete set of modified simultaneous equations. needed, are described in the following. scenarios for different types of damage. 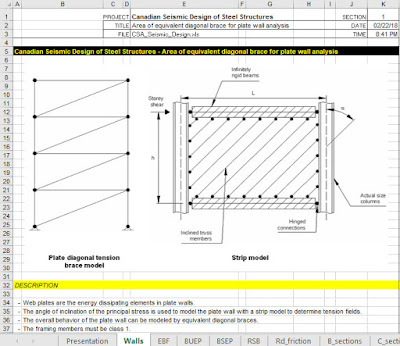 This spreadsheet provides the design and analysis of retaining wall with anchors. of that calculated by the Designer or Geotechnical Services. constraints. Consult with Geotechnical Services for the requirements. parameters, ground water levels, etc. This step is to be performed by Geotechnical Services. Services for soil and rock engineering properties and design issues. simulate staged construction. Consult Geotechnical Services for the task, should it be required. Step 5 : Space the anchors vertically and horizontally based upon wall type and wall height. 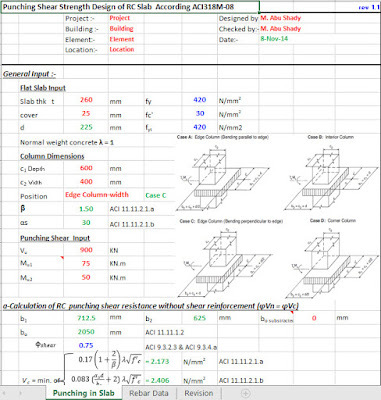 Calculate individual anchor loads. Revise anchor spacing and geometry if necessary. 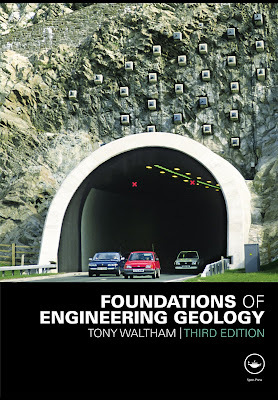 limitations, location of appropriate anchoring strata, and location of underground structures. external stability of anchored system. Revise ground anchor geometry if necessary. most likely required. Consult with Geotechnical Services for the task, should it be required. Step 10 : Structure Design analyzes lateral capacity of pile section below excavation subgrade. Geotechnical Services analyzes vertical capacity. Revise pile section if necessary. Step 11 : Design connection details, concrete facing, lagging, walers, drainage systems, etc. Consult with Geotechnical Services for the design of additional drainage needs. Step 12 : Design the wall facing architectural treatment as required by the Architect. appropriate to relegate all tank issues to the care of the manufacturer. as well as the threats of more national and state legislation. when armed with knowledge and experience. the art in these topics. crystallization, phase separation, heat exchange, and as reactors. in other applications as well as to other equipment.